Hymn Sing at both services on the occasion of a 5th Sunday! Our 5:30 pm Saturday night service and our 9:00 am Sunday morning services on the 1st, 2nd, and 4th Sundays of the month are traditional worship services. This means that the order of worship, the liturgy, and the hymns we use are typical of a Lutheran church service. We use the hymnal Evangelic Luthercan Worship for these services. The Saturday night service is held in our Fellowship Hall, and is a come-as-you-are casual worship service. The pastor does not wear vestments (an alb or stole), and the congregation remains seated during the service. Our main instrument for worship is a grand piano. 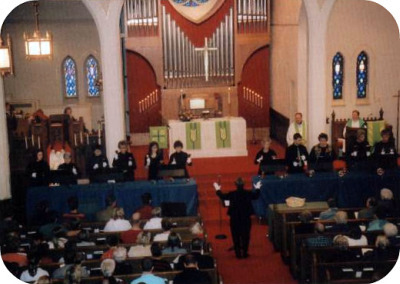 Sunday morning worship is held in the Sanctuary, and is a more typical Lutheran service on the 1st, 2nd, and 4th Sundays of the month. The pastor does wear vestaments, and the service is a bit more formal. Our main instrument for worship is the organ. One of our choirs generally provides special music. On the first weekend of the month, Holy Communion is served at both the Saturday night and Sunday morning services. When the first of the month falls on a Sunday, we still have Holy Communion at the Saturday night service the night before.